OMG, (oh my God) I was browsing the internet last night and came across this. 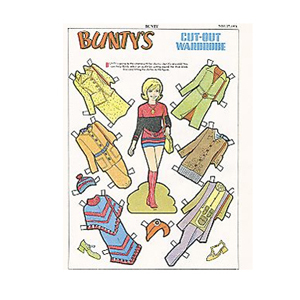 Aaaaaahhhhhh, do you remember, BUNTYS magazine, I love, love, love, Buntys. Oh brings back so many memories, like racing to the shop with my sister on a Saturday Morning, the two of us would kill each other to be the first to purchase the magazine and God forbid there should only be one, Holy WAR. We’d spend hours and hours dressing up the paper models in their stylish? outfits, it was heaven (very easily pleased as a child). The picture above is actually from Arnotts, they have a selection of canvases printed with comic strips. I wonder if I could get one of the Buntys Magazines on the internet? will defo check it out.